Input text: a [brown] carriage. a professor is -12 feet in front of and -6 feet above and -5 feet left of the carriage. it faces southeast. its hair is white. its mustache is white. its beard is white. its shirt is white. its necktie is black. 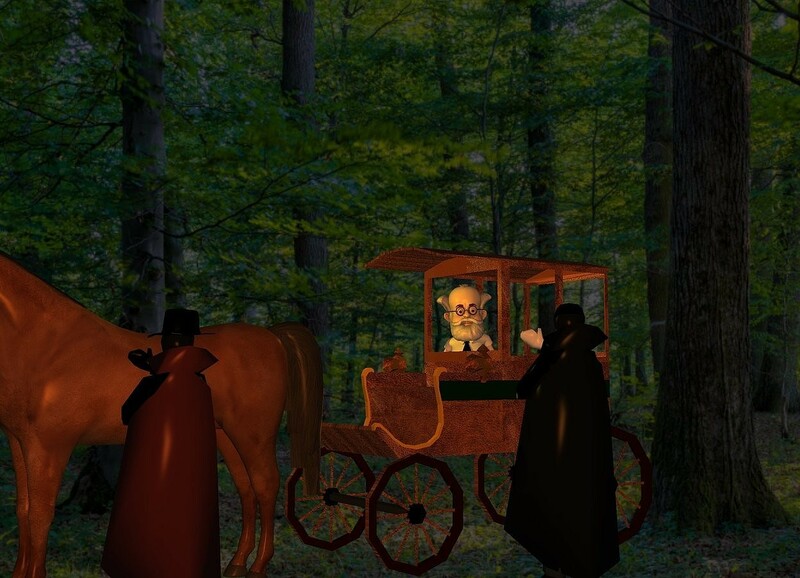 a 10 foot tall vampire is 1 foot right of and -8 feet in front of the carriage. the vampire faces the professor. sun is black. a large horse is in front of the carriage. a 9 foot tall man is right of the horse. he faces the horse. his cape is brown. his hand is black. a black hat is -.5 foot above and -1.5 foot right of the man. camera light is old gold. a gold light is 2 feet in front of and -1 foot above the professor. shadow plane is invisible. Look, my fine friend, I happen to know that this is the Lupin Express. You must be out of your tiny mind.